The NHow Berlin is so many things at once, yet it manages to maintain an effortlessly cool and utterly 'Berliner' vibe. 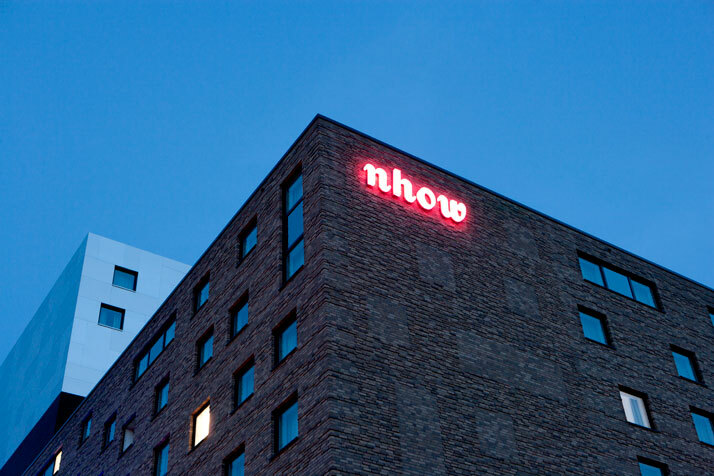 The second NHow hotel (the first is in Milan), the brand is an extension of the NH Hotels, a hospitality group mostly aimed at business travelers known for its quality service and their ability to immerse all properties into their surrounding communities with a great attention to detail and a knack for sustainability; ''Unconventional, life- affirmative, constantly in movement, locally rooted while at home anywhere in the world – an idea, in other words, corresponding to lifestyle of the new creative class.'' The hotels under the NH group are specifically known for their food and beverage programs thanks to the creative director of their F&B concepts, Ferran Adria (founder of El Bulli). 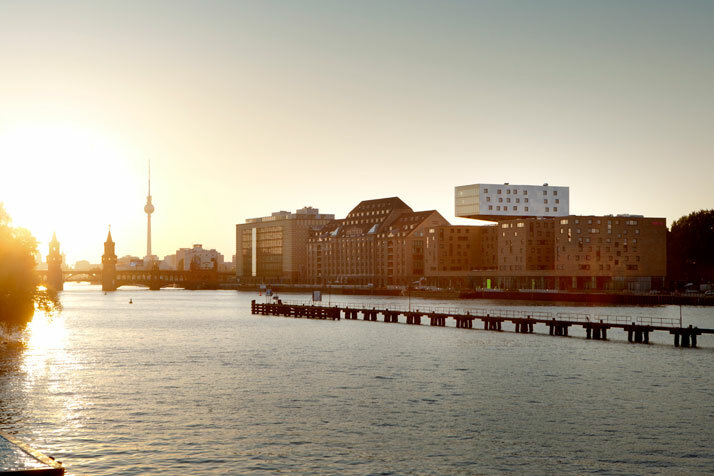 The NHow Berlin has all the star qualities of an NH hotel with an added twist. Like a cool older sibling, NHow Berlin is an example for other boutique hotels to rally their creative teams and get going on the competition! 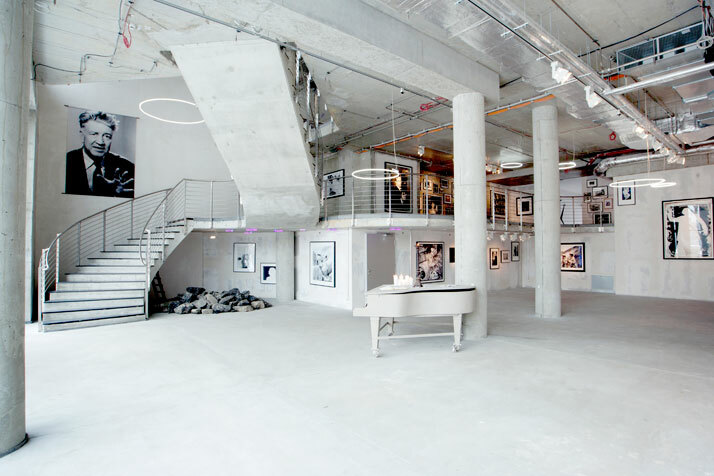 Design, art and music are the main features of the NHow, which first opened in November 2010. Seated directly on the East Port of the Spree, the hotel claims its space at the creative epicenter of the city, between the Friedrichshain and Kreuzberg districts, two communities known for their art scene and edgy nightlife. 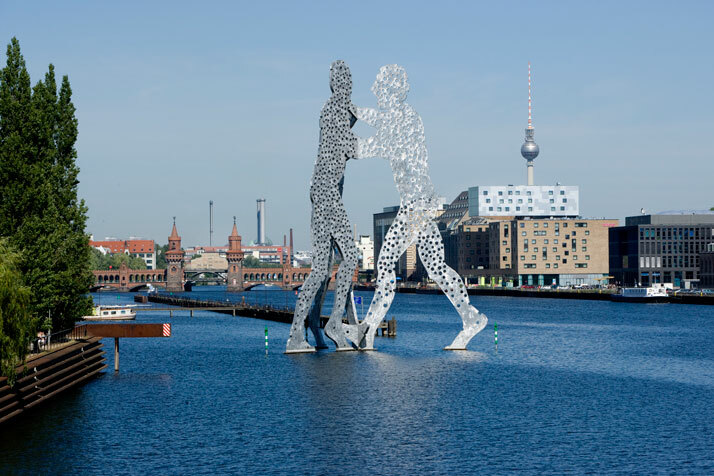 The view from the hotel is stunning, one can look across the river and have a perfect view of the Molecule Man, a striking metal sculpture that seems to stand on the water just on the edge of the Treptow district, designed by American artist Jonathan Borofsky. 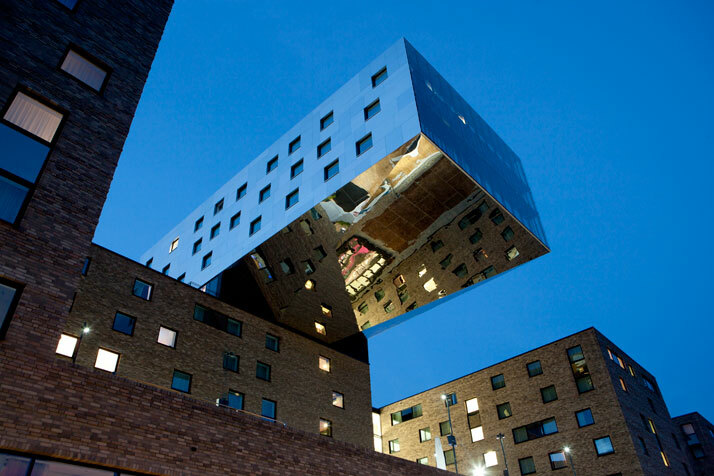 German architect Sergei Tchoban and Egyptian designer Karim Rashid worked together to surmount the task at hand, to marry the industrial style of local Berlin architecture with an unexpected and hip twist. The building would have to look contemporary, an introduction to the playful pop design inside, a way to showcase cheery bold colors while maintaining the edginess that gives this area of Berlin its ‘street cred’. To fit in with the locals here, you cannot look like you are trying too hard… The façade is meant to look like a work in progress, metal intertwining, evoking the feeling that a crane is hanging overhead, as if it is constantly on the verge of change. Sharp edges, stainless steel, and brick are characteristic of the surrounding buildings, ''Constant development and change is an indispensable part of the Berlin lifestyle and accounts for its fascination.'' 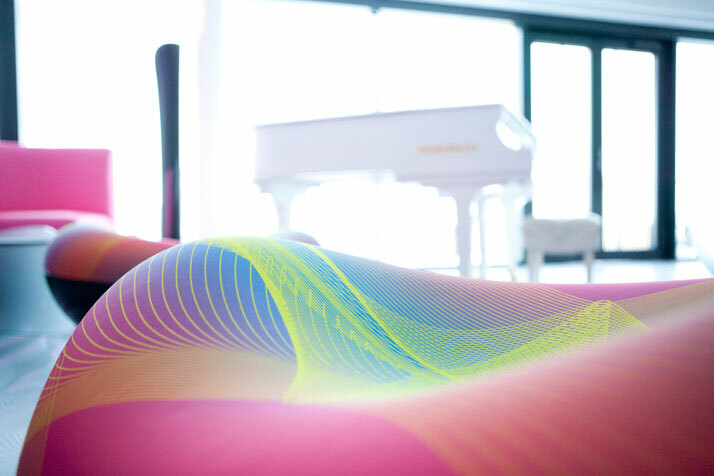 When one walks into the door you are enveloped by the imagination of Karim Rashid , a designer who has gained many accolades and awards for his work (which has been exhibited in museums across the globe including the Moma and the Centre Georges Pomipdou). Like a world straight out of his dreams, the bright colors and balloon shaped furniture are intoxicating… they are a wonderland for the creative traveler who may be looking for inspiration in their travels. 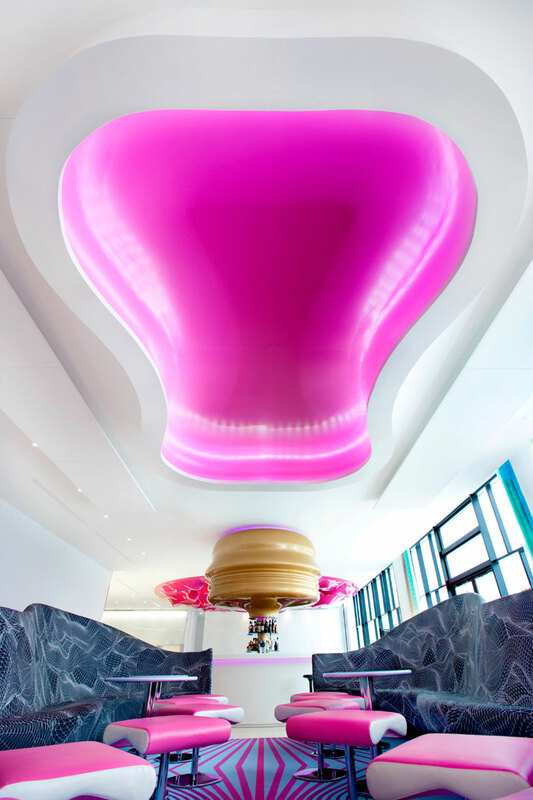 Karim Rashid was responsible for the interiors and the furniture design of the 304 rooms and suites of the hotel (233 standard rooms, 25 VIP class rooms, 45 junior suites and the NHow Suite) - furniture that was custom made for this exact hotel. 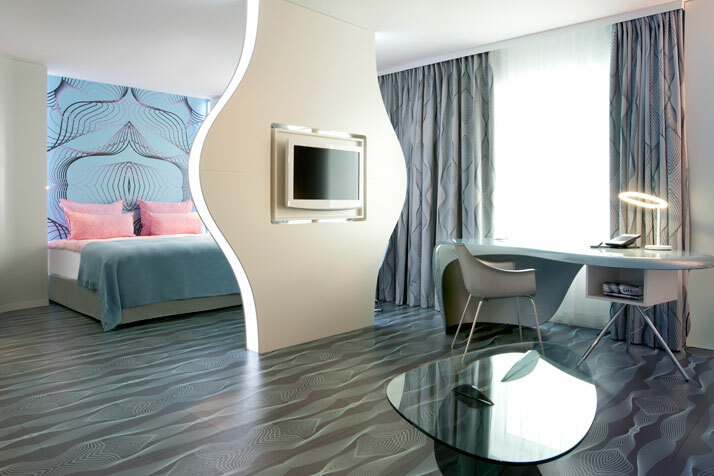 Guests of the hotel can choose pink, blue, or grey rooms (all with floors to match). 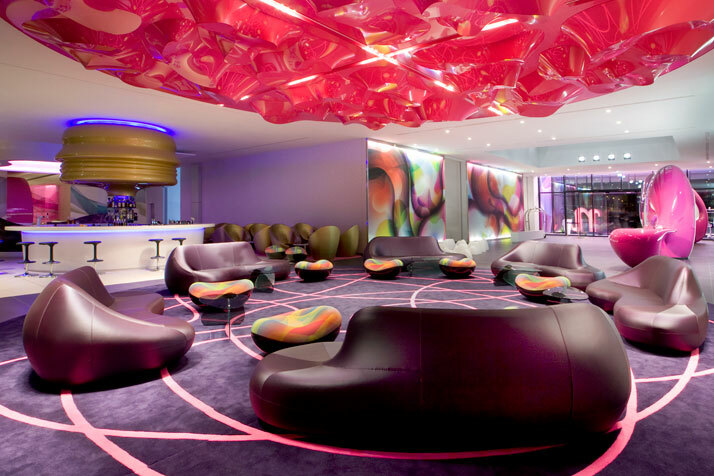 The aesthetic is referred to as ''digi-pop design'' in the hotel’s press literature and can best be described as a visual funhouse; liquid-like plastic, colorful lighting, bold colors everywhere, furniture that looks like it was puffed up, stretched out, and carved out of Play-doh… different shapes and sizes, a psychedelic treat throughout the hotel. The architect wanted to create a place you had never quite seen before, one that you couldn’t compare to prior experiences or spaces. Rashid’s vision was intended by him to be a radical design movement, ''…calling for a break with old ways of looking and living, and the creation of a world free from nostalgia'': ''My vision engages technology, visuals, textures, colour, as well as all the needs that are intrinsic to living in a simpler less cluttered but more sensual environment. Design touches us on every level, and design can continue to define and shape our dimensional interior environments and create new progressive human behaviors, and new languages. I always question whether the physical world is as experiential, as seductive, as connective, as inspiring, as personalizable, and customizable as the digital world.'' Rashid goes on to discuss some of the objects and new vocabulary he has developed along with the designs that were realized for the hotel, words and terms like ‘Infosthetic”, ‘blobject’, and ‘technorganic’. The designer truly approached this project with a desire for utter originality every step of the way, his vision was about all to bring something striking and creative to the city of Berlin. His very own world. There are many large windows and panorama windows that allow for an “openness”, views into and out of the building bringing the hotel experience onto the streets of Berlin. The roof above the reception area is partially glass, allowing guests to look up at the underbelly of the two large towers (the Upper Towers) that reach up to the Berlin skyline. 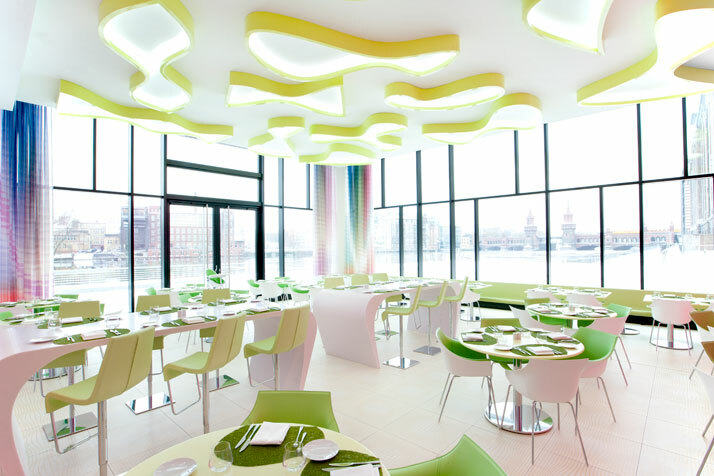 There are two bright and friendly restaurants in the hotel also carrying along the whimsical Rashid aesthetic. This brings us to what makes the NHow Berlin extra special, the Music element. 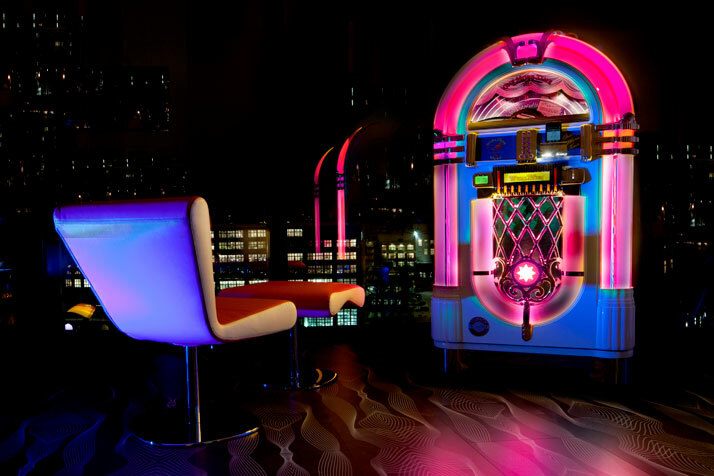 No other hotel in Europe can boast two music recording studios housed inside. It was no mistake the Nhow was placed in the heart of “Berlin’s new centre of the music industry”, with companies from record labels to music electronics firms in the vicinity “…NHow Berlin aspires to become a magnetic attraction for the capital’s music enthusiasts as well as music-lovers among its guests.” In fact, the NHow Berlin sits smack in between MTV and Universal. The music makers themselves, creative in and traveling through Berlin will find a literal play room in the mixing studios of the Music Sound Floor found on the 8th story of the upper tower of the hotel (the studios are run by the hotel in partnership with Laustark and the famous Hansa Studios to bring the highest quality experience to those who will record and perform here at the hotel). 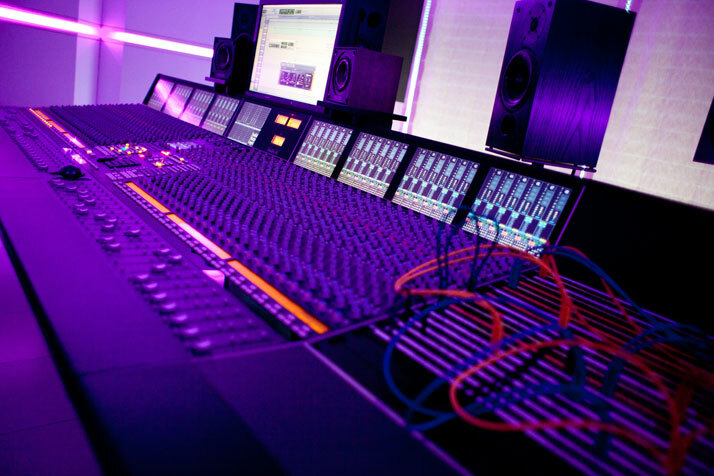 A main attraction on the Music Sound Floor is the Analog Mixing Suite that boasts up-to-date sound recording technology with some of the most coveted vintage equipment in the world. For those who prefer their technology modernized, there is the 5.1 Digital Suite where all music is created digitally. Both of these music studios are linked by a single recording booth. Here, everything from voice-overs, to instrumentals, to spoken word pieces can be performed and mastered. As if this weren’t impressive enough, there is an actual lounge extending from the studios that can seat up to 100 guests. With a sprawling view of the Spree, the music lounge has all the multimedia to delight the biggest tech geek and provides the perfect space for a music event, TV interviews, presentations, and exclusive listening sessions. For all the music appreciators that do not necessarily look for a recording studio during their hotel stay, each room is iPod ready. 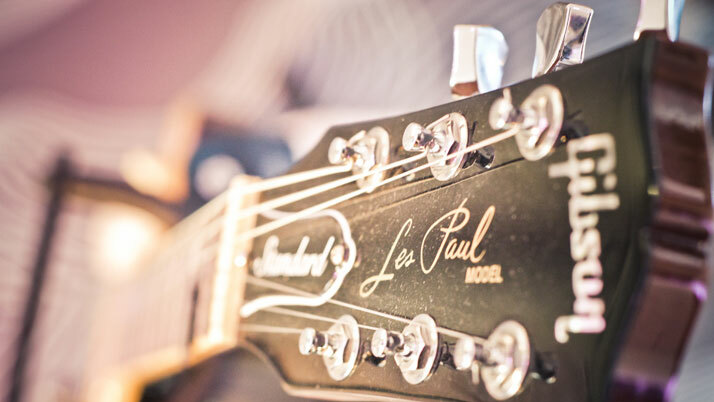 Yet, if you happen to find that room view of the Spree overwhelmingly touching and you should become inspired to write a song, just call up room service and they will be happy to bring a guitar to your door. Another deeply impressive space of the NHow is the art gallery downstairs. A constantly rotating collection courtesy of well-known and respected gallery owners around Berlin and beyond has placed the gallery in high regard among the local art scene. Seeing that this is the second Nhow hotel (as mentioned, the first was built in Milan in 2006), the location for a hotel like this was deliberate. Take, for example, the art scene and the relationship of the gallery to the hotel and all of the wonderful people it may not have otherwise brought through its doors. 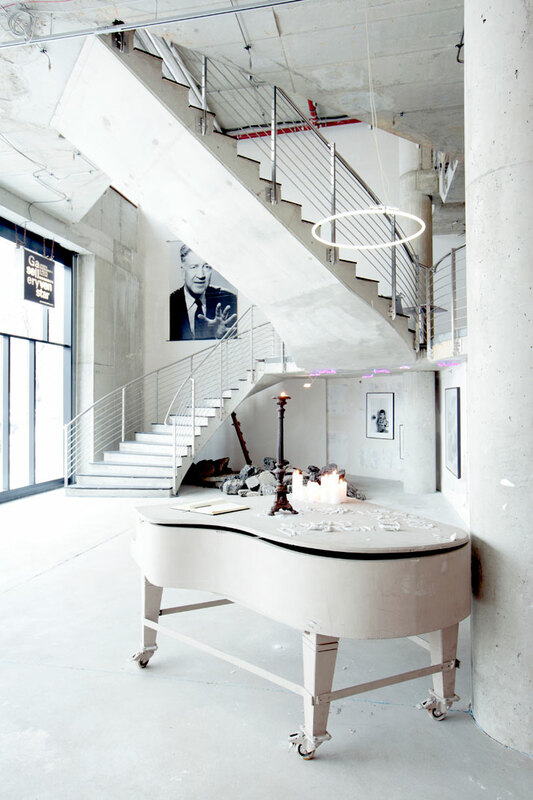 ''Creativity, love of change and a powerfully magnetic attraction for international artists characterize the rhythm of the city...'' Berlin itself is an ever-changing metropolis, the perfect place for a multifaceted concept hotel to ultimately unveil a refreshing and one of a kind hospitality experience. The gallery is a favorite public gathering spot in the hotel, the large terrace out on the river is a close second (but only during summer months, of course). There is so much more that can be said about the NHow Berlin, a truly special place in an ever changing city, but that can be left to the images that --as we know can speak far more than words can in this article. With so many hotels that grace the pages of Yatzer, it is always apparent when an architect and a designer can unite not only their visions together, but then go on to marry those creations with the city in which the hotel will call home. This is a true work of art in progress, one that if done successfully, will keep changing for as long as the building stands. That is the beauty of architecture and design.